Acadian Genealogy Homepage; ABOUT THE AUTHOR...Yvon L. Cyr! In June 1980, a cardiologist put his hand on my shoulder and said, "son, you only have six months to live...unless you allow us to perform the open-heart surgery you require" (a triple bi-pass)! At the time, I was 39 years old and had just sustained my SECOND heart attack. ME, ROLL-OVER AND PLAY DEAD? NO WAY! At the time I was National Directory of Field Service Operations for WCI Canada Limited, the Canadian subsidiary of appliance giant, White Consolidated Industries. Three days before my scheduled surgery, my boss came to see and tell me my job WOULDN'T be waiting for me, if/when I recovered! ME, ROLL-OVER AND PLAY DEAD? NO WAY! In 1981, eight months after the surgery, I left WCI and joined Inglis Limited, the Canadian subsidiary of Whirlpool Corporation where I received five promotions over the span of nine years, culminating in the position of General Manager of their Consumer Services Division. In February 1990, just about ten years after my open-heart surgery, I wound-up in the hospital with another "suspected" heart attack which, when diagnosed, turned-out to be a prolonged angina attack. ME. ROLL-OVER AND PLAY DEAD? NO WAY! But I was forced to stop working, by my doctors! So what does a 49 year old Executive do for past-time...for the rest of his life? I determined I would become proficient in the use of computers...I had a couple of computers on my credenza when I was working...but they were mostly for "show"...I couldn't find the time to turn them "on", let alone learn how to use them! My old XT served me well and I mastered DOS without great difficulty. Then came the 386 and Windows. At this point, things started to get somewhat boring and at the suggestion of a friend, I bought a high-speed modem, which certainly opened-up a whole new world! About this time, I visited one of my remaining ACADIAN uncle who resides in Grand Falls, New Brunswick and he planted the seed of genealogy! He provided me a ton of genealogical information, which he had accumulated over the years and I offered to find suitable software and attempt to trace our family history...and the real fun began! About 3000 names into the CYR family history, I made contact with a chap by the name of Greg CYR...an early participant in this CD-ROM project. He suggested we exchange data and my CYR family history grew to some 11,000 names...which, I hasten to add, contained thousands of duplicate names. [Incidentally, Greg and I have since met at an Acadian Family Reunion in Madawaska, Maine and become good friends]. And during this period of time, I read a few messages on the BBS to the effect that someone should give consideration to putting together an Acadian data base, in consideration of the "Congrès mondial des Acadiens" (1994) and from this, I got the idea of getting an Acadian CD-ROM produced, using GEDCOMS of those who would participate! After seeing numerous BBS messages from many BBS users, I saw no progress being made and so, in April 1994 I undertook the personal non-profit project of getting an Acadian CD-ROM produced, for the benefit of my Acadian cousins. Very quickly into the project, I began to realize that a) 650 megs was one pile of data and b) there was a lot of inter-mingling between Acadian and French Canadian surnames...and so the project became one which would include data from both Acadian and French Canadian cousins. Based on my experience in attempting to merge 11,000 names, I recognized the need to include some type of search/seek software...but realized this could add substantially to the cost of developing the CD-ROM. Then, out of no where, along came John Smith who liked the idea of my project and offered to provide the necessary software...gratis! What a guy, and what a job he's done with his GENSRCH software. Thanks again John... My "In Search of Our Acadian Roots" CD was released in 1994. Internet has of course, opened-up a whole new world for many of us, including me and finding the time to answer messages being received, has become a great past time for me. In July 1994, the "old ticker" started to act-up again and, after a long series of tests, I was informed in September, that I would require further by-pass surgery (a double by-pass this time)...which was successfully completed on June 26, 1995. After much much consideration and at the insistence of many good friends/cousins which I met over the Internet, I was 'convinced' to author a SECOND Genealogy CD-ROM. The "Acadian-Cajun Family Trees" was produced on my behalf by Progeny Software Inc. and released just in time for the Congrès Mondial Acadien; 1999 in Louisiana. There were in excess of 300 participants in this second venture. So, where do I go from here? I have no idea, but one thing I can say for certain...ME, ROLL-OVER AND PLAY DEAD? NO WAY! That's just not my style. In 2003, I became an affiliate of Genealogy Today who now make available my CDS on their fabulous web site. Check them out... you'll be glad you did! And the ole "ticker"? Like they say..."takes a licking, but keeps on ticking"! My latest 'project' has been to source suitable Family Crests for use on the unique products now being offered on my Acadian-Cajun & French-Canadian Online Boutique, located at http://www.cafepress.com/acadstore/ If you want to source a gift for yourself, family or friends, this is the place to visit. This is an on-going project which will probably take-up a lot of my time in the near future. Check it out! And, in addition, I am now re-building my Links Page using a fabulous new program called Link Machine. If you are the webmaster of a web site, click here... or use the following link [http://www.acadian.org/programs.html] (and use the link from there) if you want more information on this unbelievable program! 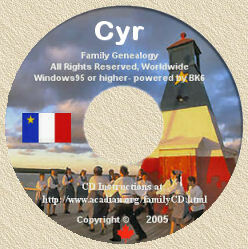 Presently, I'm in the process of updating all my 'specific families' CDS (see http://www.acadian.org/family.html), which will now include all of my personal research notes, as well as source information. That project will keep me busy for many years to come! At the suggestion of a genealogist friend subscribed there, I have recently added new designs on the Zazzle web site, which offers great "unique" and very personalized products. Check it out at here. I am the Administrator of therecently created CYR Famaily DNA Group Project at FamilyTreeDNA. We are attemting to determine the true origin of Pierre Sire (no, he was most likely not from France) using DNA. If you are Cyr and wish to help us, please consider joining our Group and have your DNA tested. In this regard, I am also a member ofthe International Society of Genetic Genealogy. And very recently, I created the Acadian and Cajun Genealogy, History, Culture and Music Group on Facebook... we have well-over 600 members (May 2011) and you are invited to join us there. Click on the previous link or just do a search on Facebook, to find us. I will be speaking and conducting 'free' genealogy seminars at the upcoming Cyr Family Reunion (August 2011) in Madawaska, Maine. Connect to http://www.acadian.org/mad-soc.html for details and/or the Cyr Family Reunion web site. Please be certain to look me up while there. I've also been invited to participate at the Violette Family Reunion (also being held in August 2011) in the Van Buren, Maine area. The Violette Family web site also has the latest details of their event. So, how's the ole ticker you ask? "Takes a linkin', but keeps on tickin'". ME, ROLL-OVER AND PLAY DEAD? NOT A CHANCE! In my 20+ years of Acadian research, I have always done my very best to be as accurate and politically-correct as possible and I hope that, in some small way, I have been able to assist others and "make a difference"... and, as my father would say... "you know you've made a difference when other authors quote you as an 'authority', in their historical publications." Thanks to all... you know who you are.